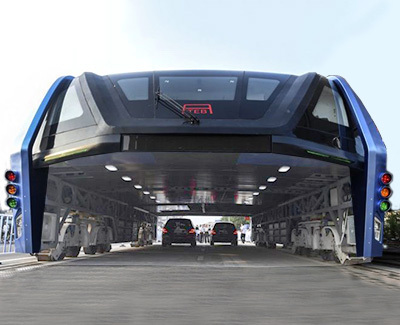 China's long-awaited "straddling bus" ran its inaugural test in Hebei province this week. Powered by electricity, the bus is able to carry up to 300 passengers in its 72ft (21m) long and 25ft wide body. The trial run was conducted on a 300m-long controlled track in the north-eastern city of Qinhuangdao. The vehicle is expected to reach speeds of up to 60km per hour, running on rails laid along ordinary roads. Up to four TEBs can be linked together. "The biggest advantage is that the bus will save lots of road space," the project's chief engineer, Song Youzhou, told state-media agency Xinhua earlier this year. "The TEB has the same functions as the subway, while its cost of construction is less than one fifth of the subway," another engineer Bai Zhiming told news outlet CCTV.